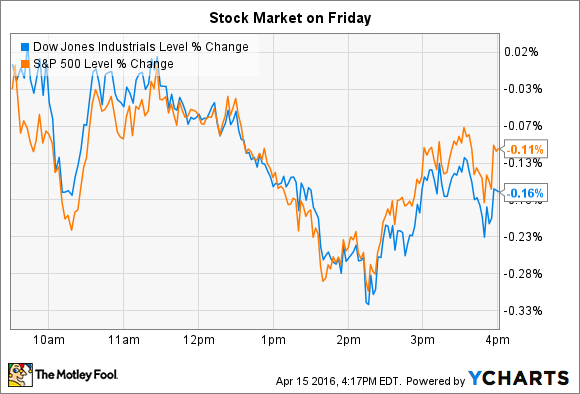 Indexes fell, but here's why these two stocks bucked the broader market trend on Friday. Despite touching positive territory twice during the session, stocks lost ground on Friday. By the closing bell, the Dow Jones Industrial Average (DJINDICES:^DJI) slipped lower by 29 points, or 0.2%, while the S&P 500 (SNPINDEX:^GSPC) lost 2 points, or 0.1%. That minor decline still left indexes significantly higher on the week, though, with the Dow up 1.8%, and the S&P up 1.6% during the past five days. Most individual stocks hovered around the index averages on Friday, but a few, including Ebix (NASDAQ:EBIX) and Infosys (NYSE:INFY), broke clear from the broader market with major positive moves. Software and e-commerce provider Ebix jumped 10% after announcing that it had bagged another major deal for its services. Just two days ago, shares spiked after the company booked a new $11.6 million contract to deliver e-government solutions in India. CEO Robin Raina said at the time that executives "expect many more such wins over the next 12 months." Investors didn't have to wait long to hear about the next big deal, as Ebix said on Friday that it has signed a contract with Placing Platform Limited to help deploy a single insurance exchange across the London insurance marketplace. The deal will bring in a hefty base of recurring revenue for Ebix, around $15 million per year for the next five years, executives estimate. Meanwhile, it represents a prestigious contract because it involves pioneering the electronic payment of insurance in the world's largest insurance marketplace. "We are honored and excited to be powering the technology behind this exchange," Raina said in a press release. Ebix's exchange division, which accounts for more than 70% of the business, grew by a healthy 13% during the last year. While its soaring risk-compliance segment contributed more absolute sales growth, Ebix will need help from both segments if it's going to keep sales rising at 2015's 29% pace. Infosys shares rose 8% after the India-based consulting and outsourcing giant posted solid quarterly results. Sales rose 13% over the prior-year period as earnings improved by 7%. At the same time, operating margin ticked up to 26% of sales from 25% thanks to continued progress in winning deals with larger clients. "Our growth trajectory improved in FY 16 and we navigated the external business environment well," Chief Financial Officer M.D. Ranganath said in a press release. The solid momentum has executives feeling confident about the new fiscal year. Sales are projected to rise by 12.5% at the midpoint of guidance, or about the same as last year's 13% increase. It's likely to continue to be a volatile global marketplace for the business, though. Growth rates this quarter varied widely -- between a 0.6% uptick in the U.S. market, 4% growth in Europe, and an 11% jump in India. That uneven performance will pose a challenge, but Infosys' operations seem set to continue improving this year. Infosys closed a few new big contracts this quarter, including one to support ConAgra Foods' (NYSE:CAG) IT infrastructure. Overall, it added three deals worth at least $75 million as its active client base grew to 1,092 customers from 1,045 in the prior quarter.